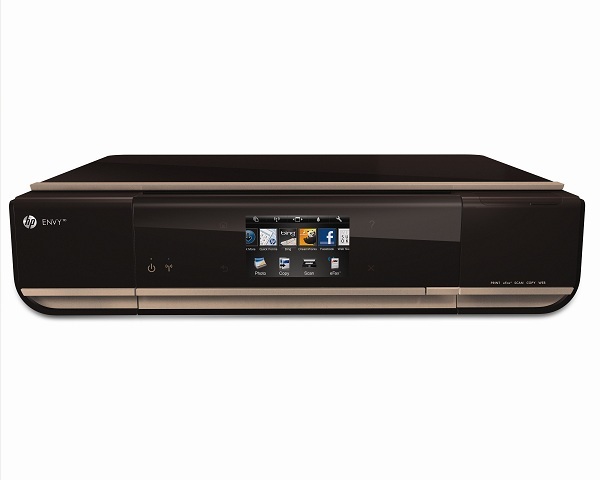 The HP Envy 110 e-All-in-One is a beautiful machine, with a small design - perfect for home use where space is limited. The inkjet multi-purpose printer can scan and print, it also features the usual e-series "e-print" functionality, allowing you to send documents to you printer from anywhere in the world, using e-mail or HP's mobile printing app for your smart phone. One of the sleekest designs in the HP e-All-in-One series, the Envy 110 e-All-in-One printer is only 101mm wide, while the control pane, and paper holder unfold automatically, making this printer ideal if you're limited for storage space. The HP Envy 110 e-All-in-One also features USB and memory card support, along with WiFi connectivity. At the front there is also an 8.7 cm LCD screen. Along with the sleek, attractive design of the printer itself the HP Envy 110 e-All-in-One also prints beautiful photos and documents. Another great feature is its robust design, for such a small piece of equipment, it is very sturdy – something that may be a relief to home users. Easy operation is also an advantage thanks to HP's smart set-up software. There have been many complaints regarding the HP Envy 110 e-All-in-One's expensive ink (HP 60), and general cost per sheet output. This combined with a slow print speed (5.2 pages per minute), and no fax function, means this is definitely not one for business users.